This is my inaugural tutorial. The aim of this, and subsequent tutorials is to offer my knowledge and “expertise” to those who are looking for specific answers to specific questions. 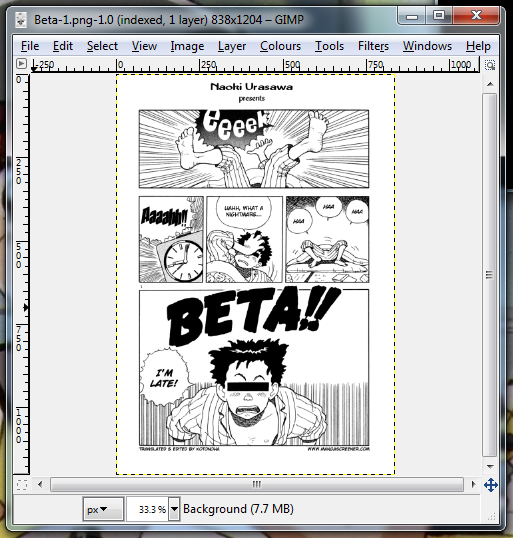 This tutorial is going to cover how you create an EPUB or Mobi of a graphic novel or manga for your eReader. Your eReader could be a Kindle, Nook, iPad or any other variant. Three pieces of free software: GiMP, 7Zip and Calbre (download and install them, now. It’ll save time later). This tutorial is provided “as is” and is meant to impart the working practises and methods that can be used to achieve a certain goal using modern computing equipment. This tutorial does contain the steps required to create an EPUB or Mobi file for an eReader using free, open source software. I assume that you are able to navigate an operating system, install software, read and understand English and follow instructions. That is all. No advanced degrees in Computer Science should be needed. Check that the images you have are numbered. They need to be numbered in the correct order. 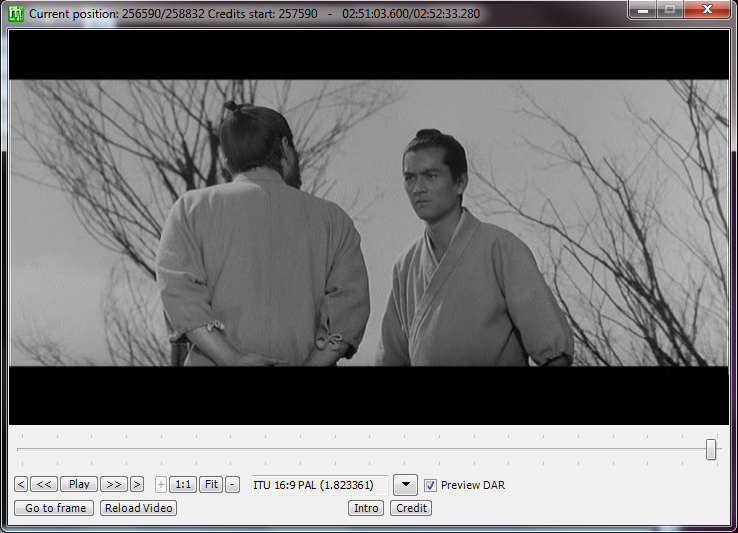 Here is a screen shot, showing you the format I mean. 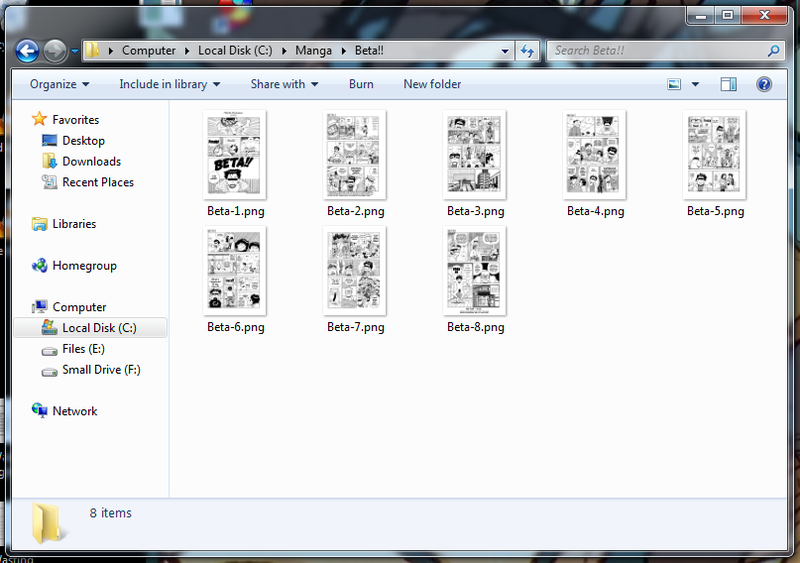 You’ll notice that this comic book has only three pages, and that they are saved as png files. To be honest, it doesn’t matter what file type the images are saved as, since they’re going to be converted into the correct format for your eReader any way. The naming convention I’ve used here is slightly different, but as long as the images are listed in the correct order, then it doesn’t matter what naming convention you use. The next thing you might want to do is edit them. All we should have to do is resize and drop the DPI for the images. Most scanned comic books, graphic novels and manga are in very high res. Ths is fine if we’re going to read them with one a computer (maybe using Comic Rack, or something), but not if we’re going to read them on an eReader; especially since most eReaders have a limited screen resolution and memory. The area that we’re going to focus on is the “Image” menu. 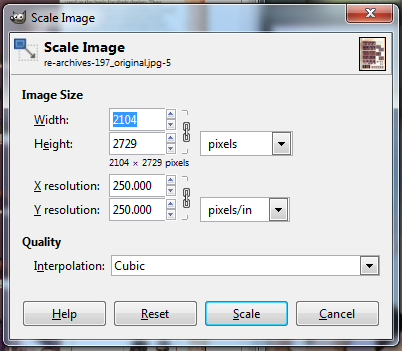 Specifically, we’re going to look at the “Scale Image” tool within the “Image” menu exclusively. The “Scale Image” tool has only a few options, and we’re only going to change three things at maximum). Next, we’re going to drop the DPI (Dots Per Inch) or Resolution of the image to acceptable levels for eReaders. Most high resolution images have a DPI of, around 200+. This means that there are 200 (or more) pixels per inch of the image. The higher the number the more pixels there are in the image(which boosts the quality). The only problem with this, is that high DPI images will take a long time to display (if they display at all) on most eReaders. The final step is to change the “Interpolation” to “Sinc (Lanczos3)” then hit the “Scale” button. You’re computer will do some maths, then produce the scaled image. Save this image (Ctlr+S/Command key + S or File>Save) and you’re done. Perform Step Two on each of the images. Come back when you’re done. I’ll wait here patiently. Right. 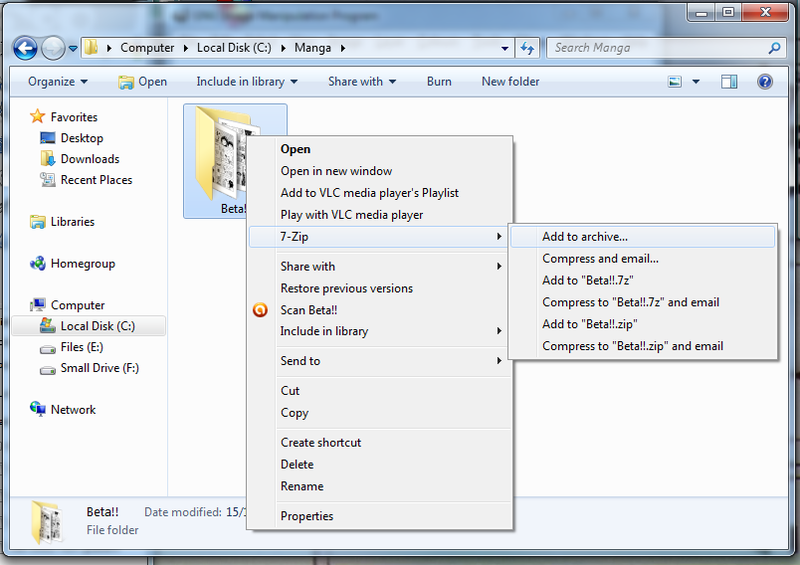 Navigate to the folder with your images in. Then go up one folder. 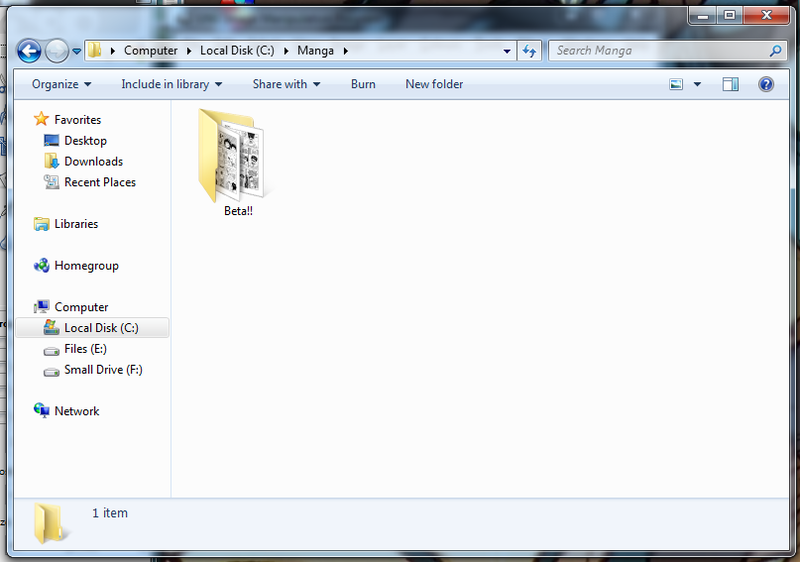 As you can see they are stored on my computer at C:MangaBeta!! 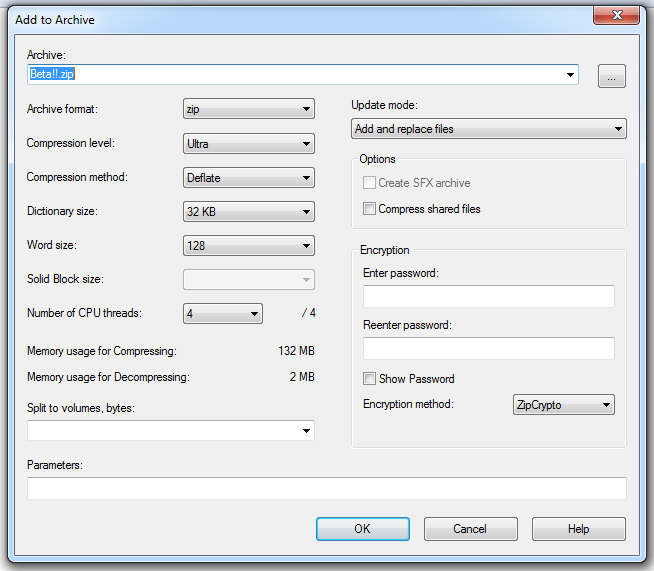 I’m using Windows here, so you’ll need to figure out how to compress a folder into a zip file on your Operating System if it is different to mine. Your computer will do some more maths and compress the comic book image files into a zip file, then turn that file into a cbz file. This one is real easy. The file that we just created? 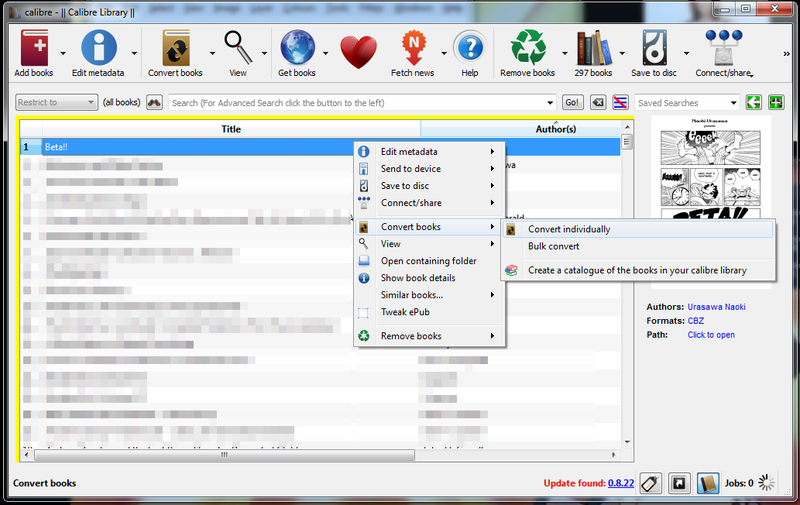 Drag and drop it into Calibre; this will add the cbz to your library of books. Adding meta-data is as simple as clicking into a box and typing it in. If you want, you can use Calibre’s built-in tools to download the correct meta-data for you (you’ll need to have the isbn number, minimum, for this to work correctly) but I’m not going to show you how to do that. When you’re done adding meta-data, click “Ok” to save the meta-data. 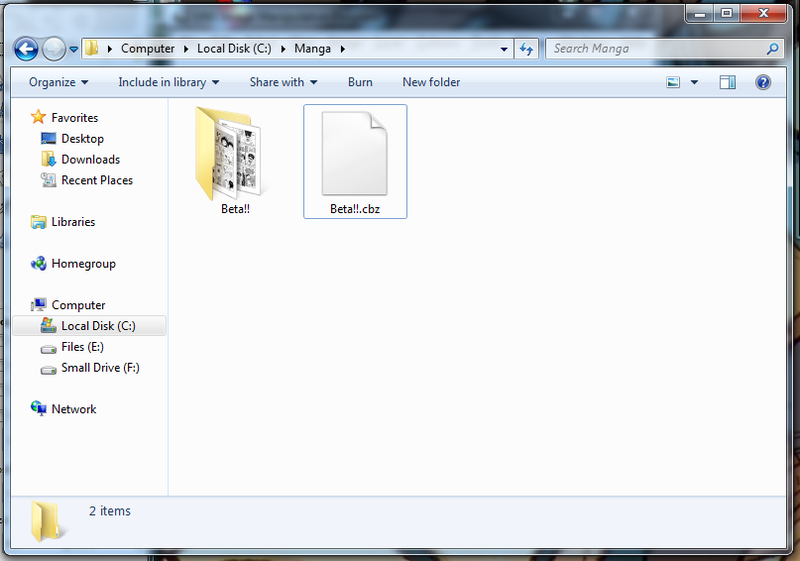 Simply click on the icon that has the universal symbol for “Recycling” to delete the CBZ file. Now click on “Ok”. 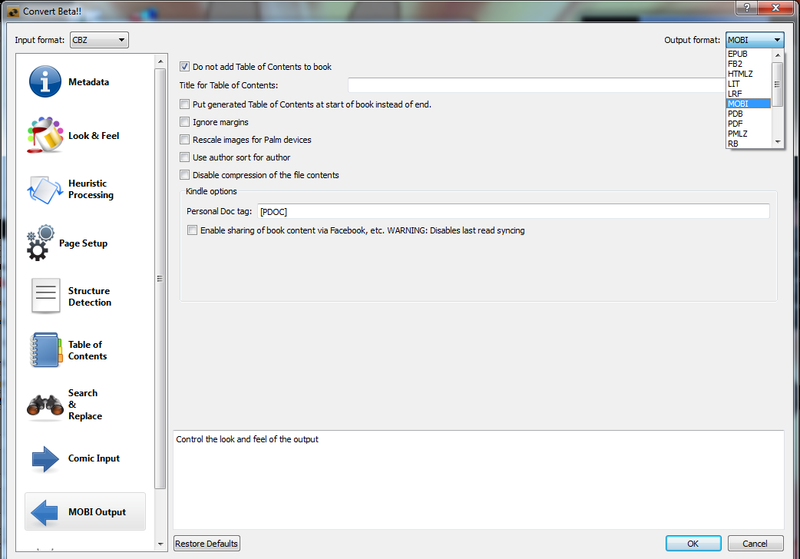 Plug your eReader into your computer and wait a few moments for Calibre to recognise it. 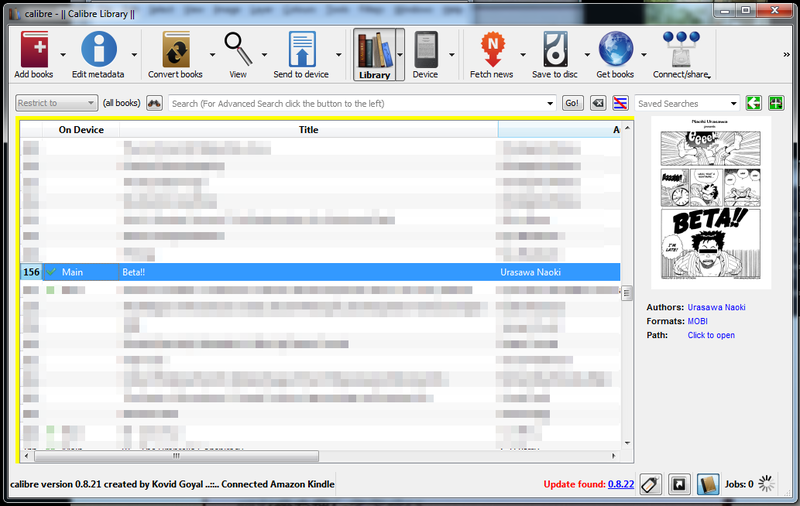 You’ll know that Calibre has recognised your eReader because a new column will be added to your library called “On Device”. In a few moments your new comic book will have been copied across to your eReader. 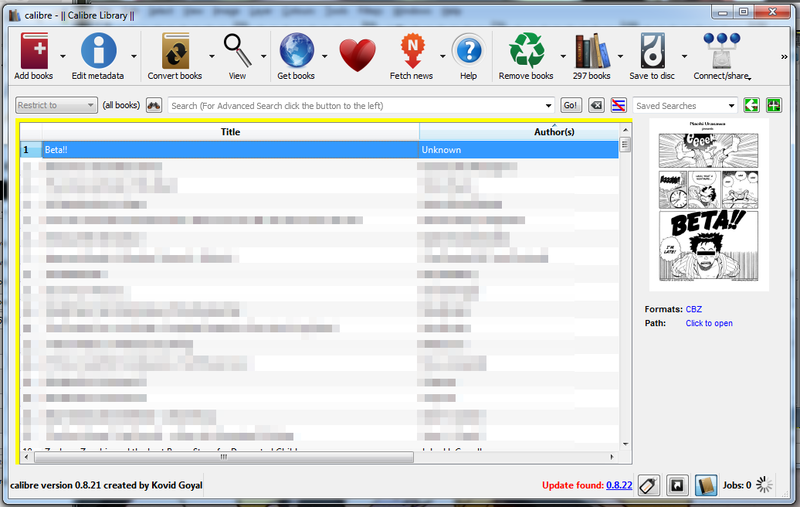 When it has been copied to your device, a green tick will appear next to the book under the “On Device” column. 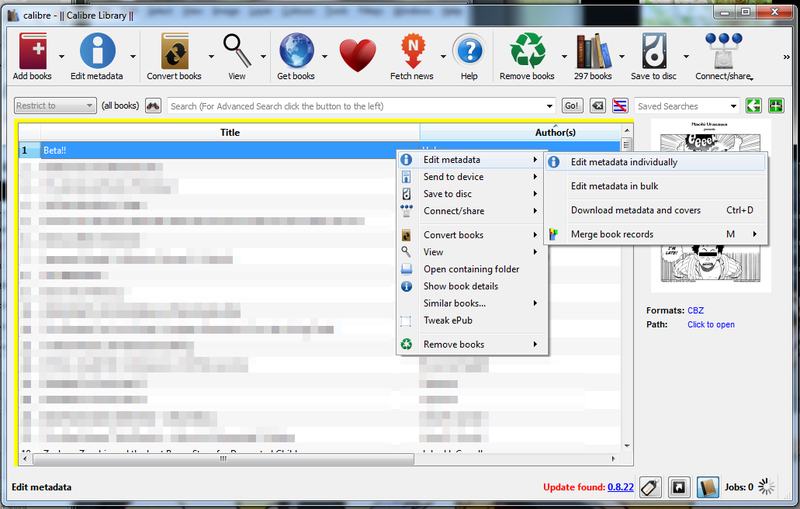 Now close Calibre and safely remove your eReader and voilà.